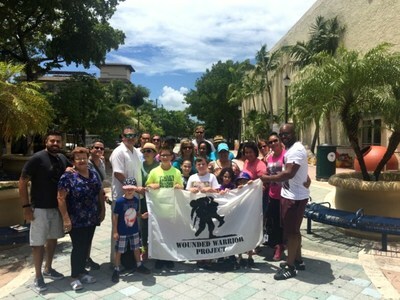 MIAMI, Sept. 20, 2017 /PRNewswire-USNewswire/ -- The flavors of Havana captured South Florida veterans during a recent Wounded Warrior Project® (WWP) event. Local warriors and their family members put their taste buds to work during a food tour. While most tours offer a unique experience for attendees, events like these mean so much more to warriors. The Little Havana Food and Walking tour took guests through the historic neighborhood to enjoy food, music, and area artists. Warriors also got to visit Maximo Gomez "Domino" Park, a well-known Miami landmark. Debra Roberts, a Navy veteran who served in Operation Enduring Freedom and Operation Iraqi Freedom, was one of the warriors who attended the event. While Debra said she learned a lot about local history and tasted some good food from Miami's Little Havana neighborhood, the highlight of the event for her was just getting out of the house. "Wounded Warrior Project means so much to me. Otherwise, I wouldn't likely leave the house. I don't like to do things alone and need the motivation to get out." Participating in activities like the food tour can help injured warriors not only socialize with other veterans but cope with stress and emotional concerns as well. In a recent WWP survey of the injured warriors it serves, 29.6 percent expressed that physical activity helps address their mental health issues.